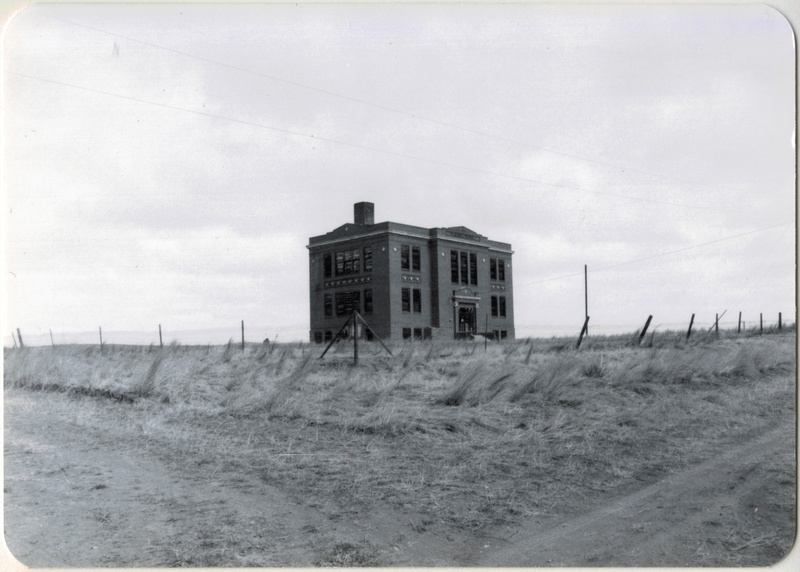 Vananda School, northern Rosebud County. I took this image during the preservation work of 1984. When I met with residents in Rosebud County in 1984, few places in the county captivated me more than Vananda, one of the county’s Milwaukee Road towns along U.S. Highway 12. Vananda in 1984 had a few scattered buildings and structures, but two landmarks, a small one-story Classical Revival bank, and the three-story Vananda school. The school in particular spoke to the hopes of the settlers who flooded into the region after the Milwaukee came through in 1907-1908. In 1917, when Louis Wahl, a Forsyth contractor, built the bank, Vananda like many other homestead towns thought a bright future awaited. But when the bust came in the 1920s, followed by the Great Depression in the 1930s, people disappeared from here even quicker than they had arrived. My favorite image of Vananda, taken in 1998.
the 1990s. 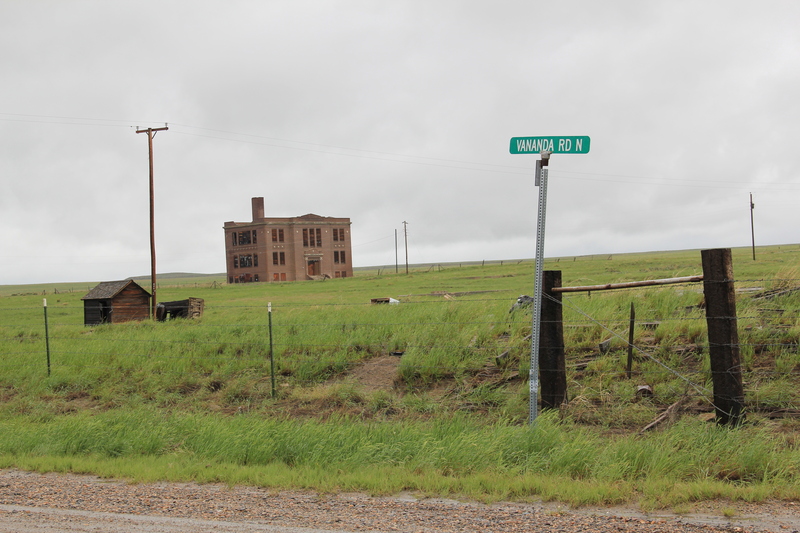 In fact, the Montana State Historic Preservation Office had listed the Vananda historic district in the National Register of Historic Places in 1990, part of a countywide effort to designate local landmarks at that time. When I next visited Vananda in 2013, fifteen years had passed. Imagine my disappointment in finding only the school, and it was looking even more worse for the wear. 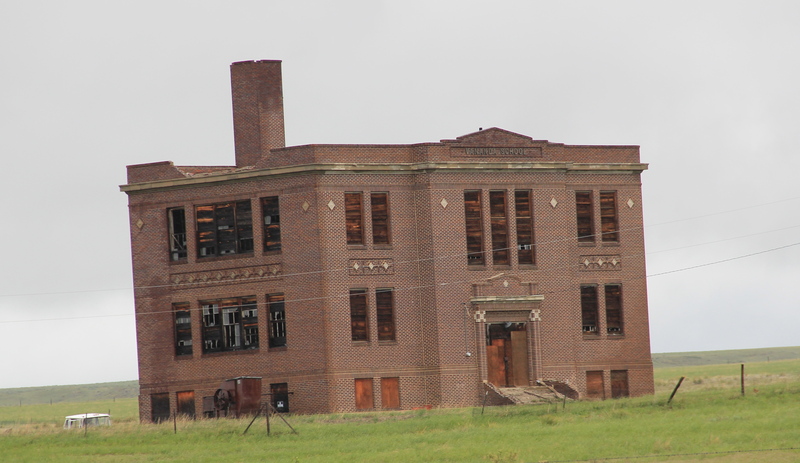 This was the same year that the National Trust for Historic Preservation listed Montana’s rural schools as one of its most threatened properties in the nation. One can hope that that designation will eventually bring help and preservation to the school. What had happened to the bank? I found out about 17 miles later when I came into Forsyth, and stopped at something new, at the town’s most prominent crossroads, at Main and 10th Avenue. It was the Vananda State Bank, moved to that location in 2002-2003. 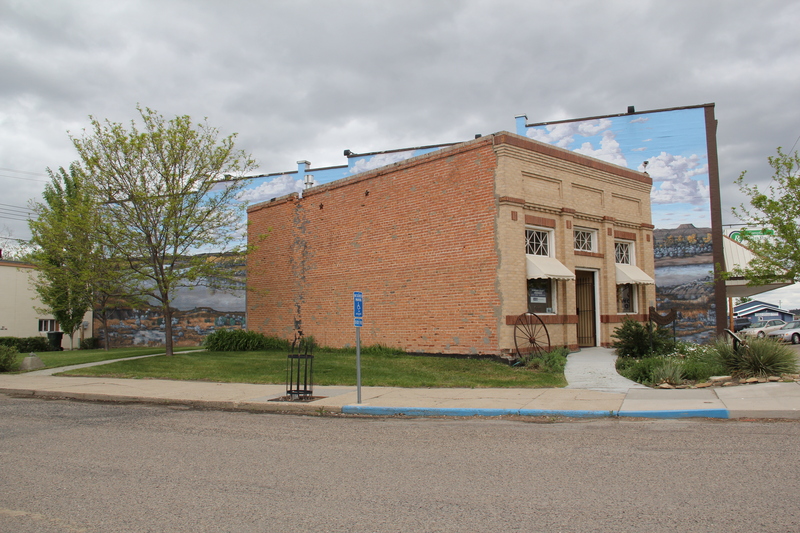 The abandoned building was now an insurance building, and an important contributor to town’s historic environment, especially since its corner lot was further enlivened by a mural of the Yellowstone River, “Autumn on the Yellowstone,” by local artist Bob Watts, who has several different murals located throughout town. No. moving the bank to Forsyth and restoring it there, rather than Vananda, is not historic preservation in its purest form. But it is preservation nonetheless in my opinion. The historic marker in front of the building tells its story, and there is an active heritage tourism infrastructure in Forsyth, with multiple historic districts, a recently expanded county museum, and a Historic Forsyth walking/driving tour you can download from the Internet. The bank and the story of Vananda remain active contributors to Rosebud County, fulfilling some of that promise first proclaimed in 1917. This entry was posted in Montana historical landscape and tagged Bob Watts murals, Forsyth Montana, Milwaukee Road, Montana Rural Schools, Montana schools, National Register of Historic Places, National Trust for Historic Preservation, Rosebud County Montana, U.S. Highway 12, Vananda Montana, Vananda State Bank Montana by carrollvanwest. Bookmark the permalink. 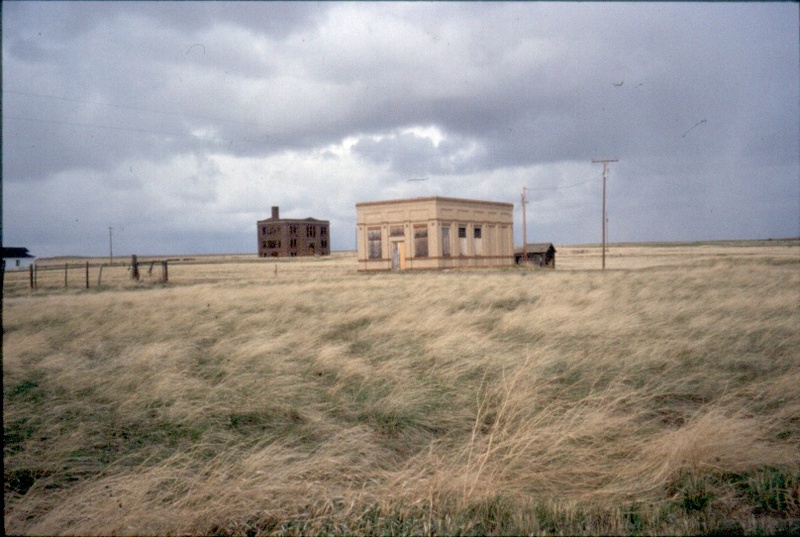 I have bought the old BUffalo, Montana schoolhouse and plan on starting renovations next year. Wonderful news: it’s a jewel!